‘Tis the season for parties—and hence, the season for gifting tokens of appreciation for homemade meals and more. While the greatness of the soft, amber glow emanating from a beautifully crafted candle is hard to dispute, I’m pretty sure hostesses have grown tired of lighting (let alone receiving) those bargain-priced roasted chestnut or spruced up pine scents, so I tend to skip the long lines and crammed mall counters in favor of gifting a California-produced red wine. This year I’m excited to gift both a great candle and a great vintage—in one. 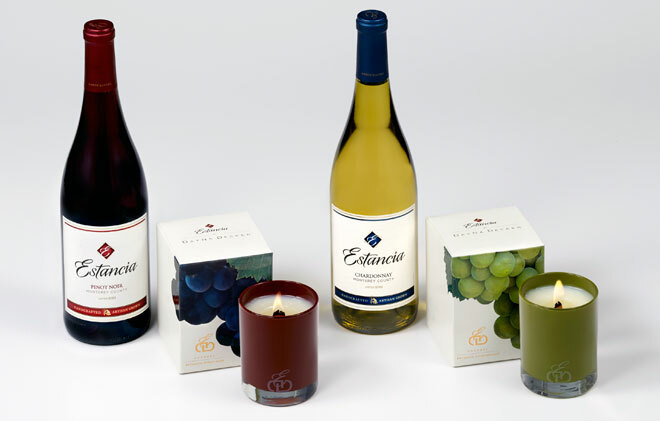 High on style, Monterey’s Estancia Winery has teamed up with luxury candle maker DayNa Decker to launch a collection of wine-inspired candles ($44) to celebrate the united energy between a wine’s simple taste and the splendor of its scent. With a burn time of over 40 hours, these perfectly blended soy wax candles are wrapped in hand-blown glass and use an organic EcoWood wick, which burns cleaner than cotton. I like the crackling effervescence of Monterey County Chardonnay (which has fantastic notes of lemon zest, Anjou pear, and creamy vanilla,) or Monterey County Pinot Noir (it smells of bright cherry, clove bud, and vanilla wood) both of which are sure to make for unexpected but sophisticated gifts. We can all raise a glass to that. A native Angeleno, Navdeep Mundi is a Leo, hates cilantro, and has studied beauty products for more than 18 years. She spends her days directing media and strategy and her nights sniffing out slightly quirky yet impeccably pretty things along with her German Shepherd, Le Tigre.